I’d tell you that three weeks ago I had a real coffee date with the Ultimate Coffee Date’s fabulous hosts Deborah and Courtney. The plan started to come together when Deborah asked about the LOVE sculpture I’d ridden past in Leesburg, VA and then posted a picture of earlier in the week. 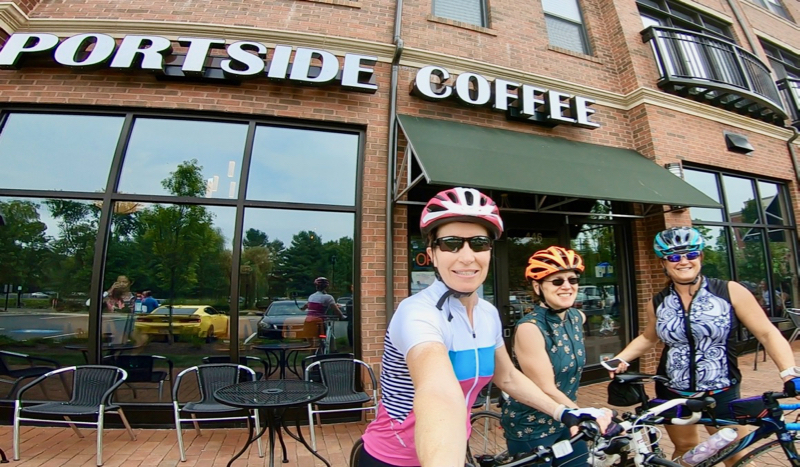 During our ride, we stopped at Portside Coffee for muffins, scones, and water – it was too hot for coffee. It was so nice to spend time with Deborah and Coco and to get to know them a little bit better. I’d met Deborah once before at the For The Love Of It 10K and a subsequent coffee date, but this was the first time I’d had the opportunity to meet Coco. They’re both just as nice in person as they appear on their blogs! I’d tell you I found the most amazing peach bruschetta recipe on Liz’s blog. I’ve made them three times already – once for a Cruisers get together and twice just for Bill and me. They are easy to make and I guarantee you’ll love them! The first time I made them I couldn’t find burrata at the grocery store down the street so I substituted it with fresh mozzarella. I liked it so much that I’ve stuck with it, but next time I’m in Wegman’s I’ll pick up some burrata and give that a try. I’d tell you that I ordered new trail shoes recently. I’m pretty sure my Saucony Peregrine 6 were the most comfortable running shoes I’ve ever owned. Luckily, I had purchased two pairs, but as my second pair reach their final days, I decided it was time to replace them. I ordered their most recent model, the Peregrine 8 (affiliate link), and they’re real beauties. Unfortunately, the toe box is smaller and they hit the boney part of my foot at the base of my big toe in a very uncomfortable way. I’ll wear them because they don’t hurt any worse than any of my other shoes, but I can’t help but ask why shoe companies must change their shoes with every model. You should see the number these soles do to my carpet when I walk across it – all the better to grip the mud, though! I’d tell you that Bill and I celebrated our 37th wedding anniversary on August 1st. We celebrated at Bone Fish Grill with martinis, bang bang shrimp, and scallops for me/salmon for Bill. It was delicious and free! Three of my clients gave me a very generous Bone Fish gift card for Christmas and I had saved it for a special occasion. I’d tell you that Bill got me a new bike for my anniversary gift – 37 years is aluminum and carbon, right. 😉 Actually, he put a reservation on a bike that won’t be in for a few more weeks (2019 model). It’s a good thing he was in charge because I was considering this Specialized Turbo that Grandma Joan rides! I’d share with you an exercise joke that Alexa (affiliate link) told me. How do hamsters stay in such good shape? They’re wheely good runners. What’s a recent recipe you’ve tried that you love? 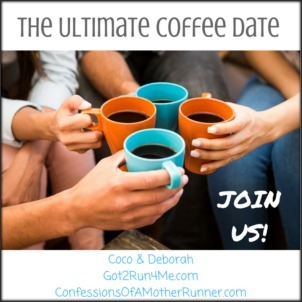 Your “coffee” date with Deborah and Coco sounds wonderful. Wish I lived closer to all of you DC/VA bloggers! 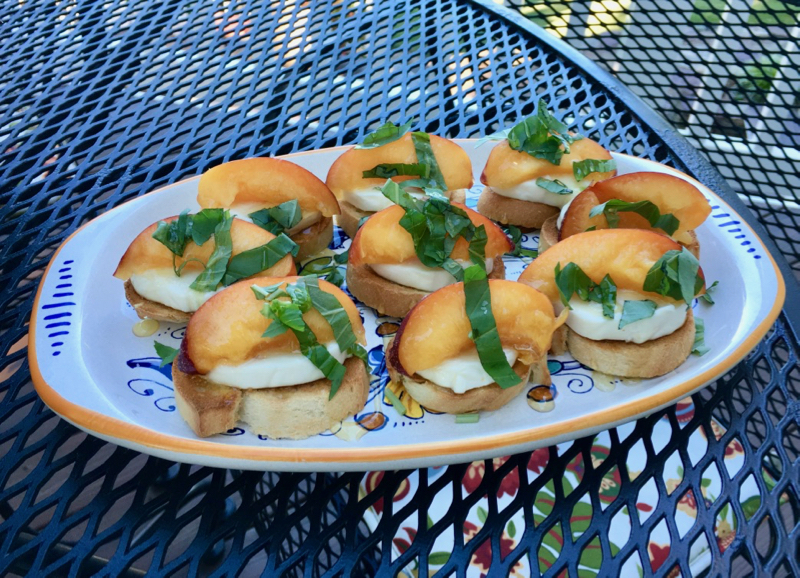 And that peach bruschetta….Yum! I will have to try it! Isn’t Wegman’s the best? I’m lucky in that I live about ten minutes between two different Wegman’s! Happy anniversary! I love that he got you a new bike. I can’t wait to see pics of it! I’ve seen a LOVE sculpture in VA but not the one in Leesburg! That peach bruschetta looks amazing, and yay for Sauconys! I love the color! You definitely should try the peach bruschetta. It’s as yummy as it looks! 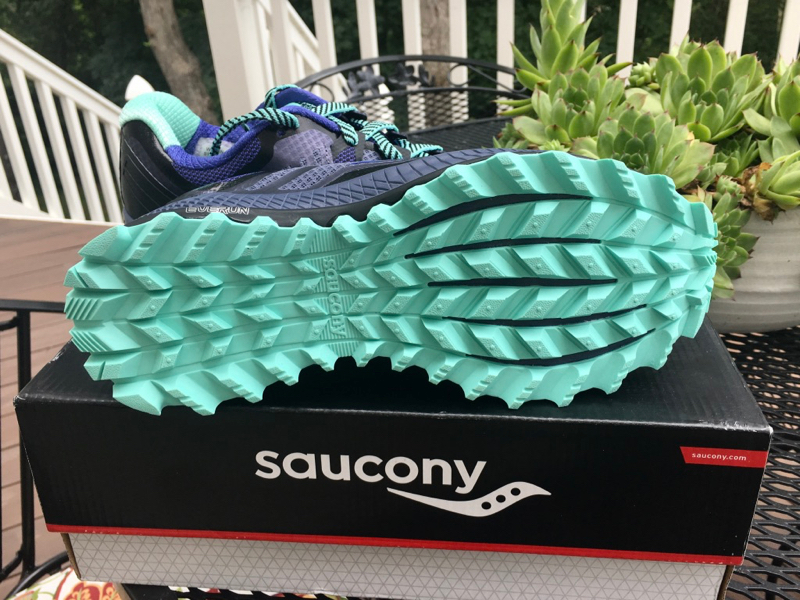 Happy Anniversary , those new trail shoes look pretty cool! Very cool that you got to have a real coffee with Deborah and Coca! It was definitely fun having a real coffee date with the girls! It was really fun riding together — and chatting over not-coffee 😉 Congrats again on your anniversary. We will be celebrating #30 in October. We love Bonefish — what a great gift! Bummer on the new model of trail shoes. It is so frustrating! Thirty years – congrats! Do you have big plans for your celebration? Happy Anniversary to you and Blll …37 years is monumental! And I can’t think of a more romantic gift than a new bike …seriously. That’s right up my alley! 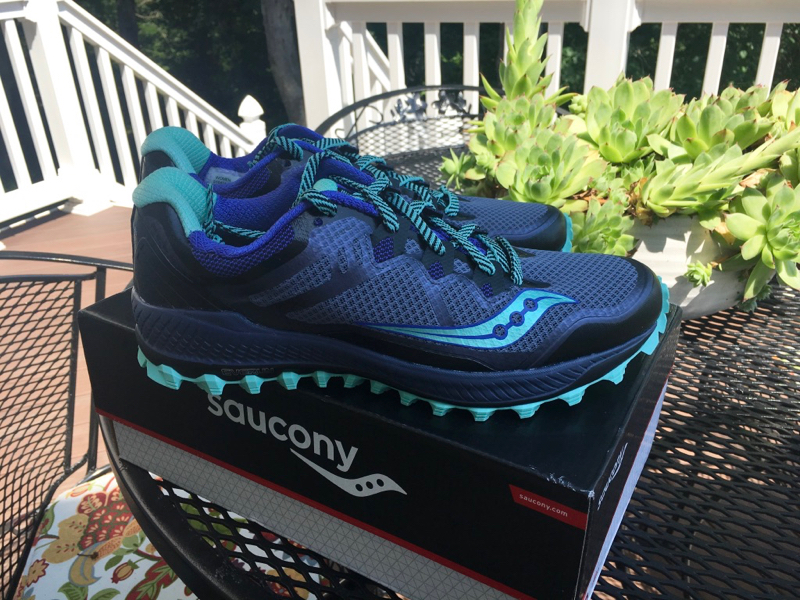 Cool new trail running shoes …does this mean you’ve got your eye on another trail race for the near future? I think I’m falling in love with trails myself! That peach bruschetta looks delicious …then again anything involving peaches would have to be incredible! Thanks, Teresa! 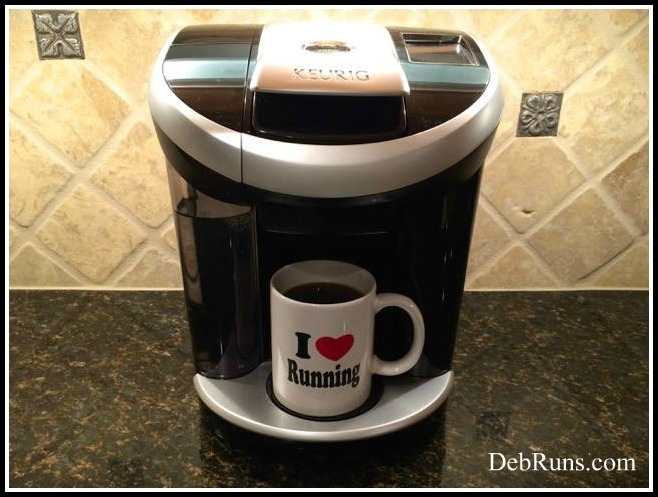 Yes, I’ve always got my eyes on an opportunity for a trail run. I’m hoping to do a 5K trail race in October. The first half has over 1,000 feet of elevation gain running up a mountain. Yikes! That’s a lot of gain over a mile and a half!! Your IRL coffee date sounds fabulous! Happy anniversarry! It was and thank you!